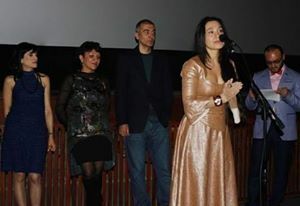 On March 25, Arshak Amirbekyan interduced his movie “Mariam’s one Sunday”. The main cast is Ruzan Vit Mesropyan and Ashot Adamyan. According to the director the film was shot exclusively by his and his supporters finances, and the idea occurred when about a year ago he was walking along the same streets where happened the first episode. The author is impressed by the moment when someone from the group of prostitutes having seen how he put his hand on his heart, said: ‘’how can the heart survive this life?’’. The main character is a mature artist (Ashot Adamyan), who accidentally meet the heroine – 20-year-old prostitute Mary (Ruzan Vit Mesropyan) early Sunday morning. The whole day she spent with the artist and his family enjoying their human, caring, unselfish attitude and gradually psychologically transformed.